1. GE's cash crunch: General Electric in such financial stress that it may soon do the unthinkable: cut its beloved dividend. John Flannery, GE's new chief executive, is under enormous pressure to restore confidence in a company facing a serious cash crunch and a nosediving stock price. One-third of GE's market value has vanished this year, making it the biggest Dow loser by a long shot. GE (GE) is holding an investor update on Monday to detail a strategy to stabilize the company by slashing costs and selling off more businesses. Wall Street analysts are bracing for Flannery to announce layoffs and just the second cut to GE's coveted dividend since the Great Depression. 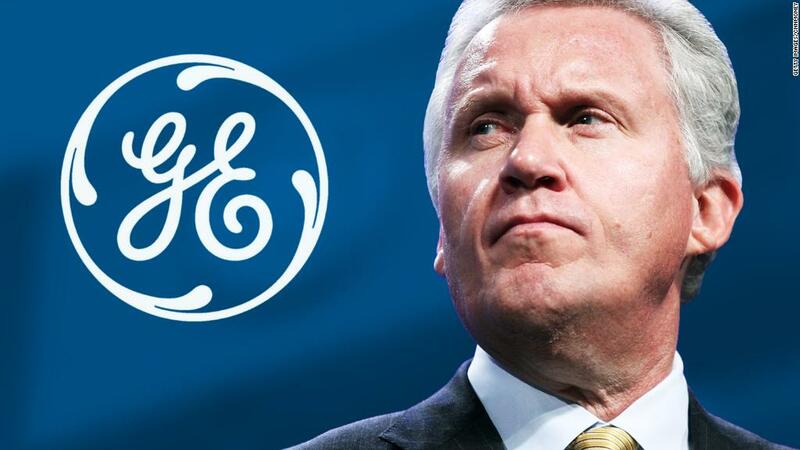 GE confirmed in a statement on Friday that "employee reductions," some of which have already begun, are part of a previously-announced plan to cut costs by $3 billion. After GE reported awful results last month, Flannery said the dividend remains a "priority," but he didn't rule out a reduction. The problem is GE isn't generating enough cash to cover dividend payouts promised to shareholders. It's a stunning development given GE's iconic status and a sprawling business that makes everything from jet engines and light bulbs to MRI machines. GE is one of America's most widely-held stocks, making a decision to cut the dividend even tougher. Countless shareholders, including retirees, have come to rely on the quarterly dividend payments. "Retail investors have stuck with GE through many, many years of underperformance simply because they've counted on that dividend," said John Inch, a Deutsche Bank analyst with a "sell" rating on GE. "If you cut that dividend, all of a sudden that confidence is shaken," Inch said. GE says it's been paying its dividend for more than a century, "proving its strength and reliability." The first dividend cut occurred in 1938 in the midst of the Great Depression. The company also cut its dividend in 2009 during the Great Recession. But unlike those times, such moves are rare right now. Many companies are ramping up their dividends because the U.S. economy is healthy and the stock market is booming. 2. Movement on tax reform: The GOP tax plan is marching along. Senate Republicans unveiled the contents of their tax reform bill on Thursday, a week after their House colleagues released their own legislation. The House legislation also cleared the Ways & Means Committee. Compass Point Research, an investment and research firm, predicts that the House will consider and may pass the GOP tax plan next week. It's no surprise that things are moving quickly. Republicans in the House and Senate have vowed to present President Trump with a plan before the end of the year. For businesses, there are a few key differences between the House and the Senate's version of the bill, including when a corporate tax cut would take effect and how pass-through business income is taxed. The National Federation of Independent Business, which came out against the House's plan, said it was "very encouraged" by the Senate's revisions. Of course, much work remains: The House and Senate bills' differences have to be reconciled and Republicans hold only a razor-thin lead in the Senate. 3. U.K. unemployment remains low: The U.K. Office for National Statistics will reveal its latest employment figures on Wednesday. Despite Brexit fears, unemployment in Britain is very low. In the spring, British unemployment hit its lowest point in 42 years. Since then, it has moved even lower, holding steady at around 4.3% in recent months. But low unemployment doesn't necessarily mean all is well in the U.K. According to the latest data, average weekly earnings fell by 0.4% without bonuses, when adjusting for inflation, compared to the same period last year. And at the start of the year, banks began planning an exit strategy from their London offices -- suggesting that the city's days as a financial hub may be numbered. 4. Retail's bright spots: Retailers will continue revealing their financial results next week. On deck are some of the industry's strongest performers. Shares of Home Depot (HD), which is set to report on Tuesday, have spiked by more than 20% this year. Best Buy (BBY) and Walmart (WMT), both set to report on Wednesday, have each soared by more than 30% this year. Their success marks a bright spot in the dismal retail landscape. Some struggling retailers are also set to report next week. Target (TGT), L Brands (LB), Gap (GPS), Abercrombie & Fitch (ANF) and TJX (TJX) are more representative of the retail industry -- they have painted a much more pessimistic picture. 5. Will oil continue to rally? Oil prices have been rising for five weeks straight, and they recently hit a two-year high. A few events next week could determine whether that rally continues. Oil ministers will meet at the Abu Dhabi International Petroleum Exhibition and Conference on Monday through Thursday, and OPEC will release its next monthly oil report on Monday. On Tuesday, the International Energy Agency will reveal its World Energy Outlook. Taken together, these reports will offer clues into projections for both supply and demand for oil.